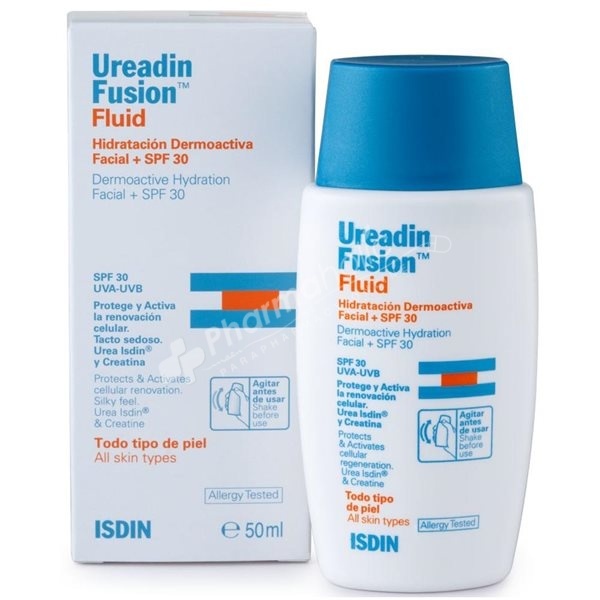 ISDIN Ureadin Fluid Fusion is a moisturizing facial skin active everyday protector for normal to dry skin with SPF30 sun protection factor. High hydration with less fat and lighter texture. Easy extensibility and immediate absorption. Formula tested under dermatological control - Allergy tested. From the 21 years the cell renewal process slows down, lowers the level of hydration and the skin becomes progressively thinner, more fragile and less luminous. The Creatine provides energy to the cells increasing their repair capacity and stimulating the synthesis of collagen and elastin. Protects against the effects of solar radiation UVA-UVB: antioxidants and SPF 30 High photoprotection. Shake before use. Apply on clean skin on face and neck. Excellent as a makeup base.